I started using VMware products with a VDI project at my employer, an equipment manufacturer with around 500 users, in 2007. I went to the VMware Infrastructure 3 Fast Track class, which was a 5-day course that combined “Install and Configure” and “Deploy, Secure, and Analyze” courses into one jam-packed week. This was definitely more information than I was prepared to absorb at the time – I was really just a helpdesk tech with no real server administration experience to my name. After the training, I hit the books and tried my best to learn as much as I could. After a couple of months, I took and passed the VCP3 exam in early 2008, which was my first technical certification. A year or so after that, I took what experience I had gained during the design and pilot of that VDI system, and parlayed it into a full time VMware admin job on the east coast. I’d like to take this opportunity to publicly thank my first mentor, Rusty Hilim (@fordman_069 on Twitter). He provided leadership and oversight for me when I honestly had no business doing work at the level I was. I absolutely wouldn’t have gotten as far as I have without his mentorship in the early days. I’m forever grateful. In a nutshell, it was what was next. 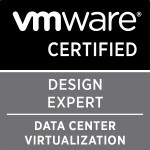 After completing the VCAP5-DCA/DCD and VCAP-DTA/DTD certifications, I was left with either looking at the CIA/CID exams or trying for something outside of VMware if I wanted to do any non-VCDX certification (and what am I going to do, not push forward? If you’re not improving yourself, you’re falling behind everyone else who is). Since I work for VMware, I decided to push forward with the VCDX. I completed VCAP5-DCA and DCD certifications within a couple of weeks of each other back in August 2013. The DCA I took two weeks before VMworld 2013, and the DCD I took at the show. I took and passed the DCD on Monday and found out I passed the DCA a day later. At that same VMworld, I went to my first VCDX bootcamp, which was a huge wakeup call – I was nowhere near ready to take on VCDX defense. I started serious work on my design in June 2014. By that time, I’d gained quite a bit more design experience both as a VMware-centric consultant at a partner and as a Senior Consultant at VMware working in the Professional Services Organization. After grouping up with some of the smartest guys I know (you know who you are <3), I put in over 500 hours over the next 4 months completing my documentation set, revising, reviewing, revising again, reviewing again, submitting, getting accepted to defend, prepping for defense, creating my defense presentation, revising, reviewing, revising again, reviewing again, doing mock defenses (over and over and over), and then finally defending successfully in October 2014 at the Palo Alto defenses. Don’t underestimate the amount of time and effort it’s going to take. If you have a significant other, kids, a pet ferret that loves you, whatever, get their buy in before you think about doing it. You are going to neglect them for months if you want to be successful. I can’t say that it’s for everyone, because with 190 VCDXs in the world, it’s obviously not. But if you are considering attempting VCDX certification, know what you’re getting yourself into. Don’t look at someone who achieved VCDX, and say to yourself, “Hey, I’m smarter than that guy/gal. I should do that, too!” (Like I did). Do it, because it’s a goal of yours. Do it, because it enables you to do X, Y, or Z. Do it, because you want to validate your skills as a vSphere/View/NSX/vRA architect. I absolutely would have started earlier. I didn’t feel all that great about my design when I submitted it and was pretty close to deferring to the next defense date. That could’ve been avoided if I had just started working in earnest a few months earlier. Working at VMware, being a VCDX isn’t the biggest thing in the world (I’m 1 of 81 VCDXs working at VMware in all different sorts of capacities). Certainly there was a lot of congratulations, both from my peers, as well as my management chain, but that was about it. In the end, achieving VCDX certification was more about improving and validating my architectural skills than recognition, financial reward, or whatever other reasons people do it. In that sense, it was absolutely worth the effort. I’d do it again in a heartbeat.